Today, I bring you a guest post from my fellow Unbounder and all-round fascinating person, Lev Parikian. 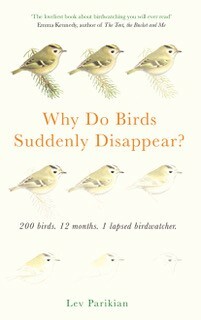 His book Why Do Birds Suddenly Disappear? has been released this week and Lev joins us as the first stop on his blog tour. I'll include the schedule at the bottom of the post so you can follow along. Marry me now, O wonderful stranger. On the opposite end of the spectrum are the ones every writer dreads. To be fair, these questions are no worse than those I’d ask if I were talking to, say, an actuary (always assuming that there were one very, very famous actuary in the world, and also a prize for actuary-ing that a lot of average people have heard of). I know nothing about actuary-ing, so any conversation I might have about it would tend towards the fatuous, on my side at least. But there’s one response that, for some reason, makes my hair itch more than the others. The trouble is that writing is, in one sense, very, very easy. You just sit down and throw words onto a screen. Anyone who uses words (and that’s pretty much everyone) can do it. But then, having killed that pernicious entity, and thrown all those thousands of words at the screen, you have to get in touch with a related part of you that’s able to look at what you’ve written, acknowledge that it is indeed rubbish, but that that’s ok, and this is what we have to do to make it better, now have some chocolate and stop crying and we’ll work at it together, shall we? And then you just do that many, many times until what you have is a readable book. In short, writing (and this has been said by many people more knowledgeable and better qualified than me) is rewriting. So now you know how it’s done. See you back here in a couple of years.